When I learned that the title for this month’s mandala is “be in our bodies”, I found it curious…wondering what they meant by it. Then I experienced the opposite and understood. I went into one room of my house to sit while talking on the phone. I then wanted to share something from my computer and while still talking I made haste to where the computer was and then realized I had left my glasses by the chair in the other room. So I had to hurry back to retrieve the glasses and then go back to the computer. I was so focused about being on the computer, that I missed the glasses. This is a silly little example and yet it exemplifies what happens when our minds are 10 steps ahead of our bodies. Another similar example is rushing out the door and forgetting something only to have to go back to get it. Whatever time we had initially saved was lost 2x overs by having to go back in. One day I actually had to go back in 3 times before my car even left the driveway! If I had just slowed down, taken a deep breath and stopped to checked if I had everything I needed, I would have maintained my serenity and saved some much needed time. The bruises on my body also remind me of the many times where my mind was ahead of my body. Slow down! Another way to be in our bodies is to use our bodies as sensory tools that let us know when something feels right/true or when something feels off. We tend to ignore these signals because our minds see that as illogical. Then later we realize that we should have trusted our gut feelings. For this aspect of “being in our bodies” all we need do is practice listening to our bodies. Be in the moment, take a conscious breath, and check in with how the body feels. If there’s any tension or anxiety, where is it in our body? What are we doing or about to do? Why is the anxiety/stress/fear there? When we take the time to answers these questions, we can change our thoughts and take any corrective action. Without doing this, we run around by default in whatever current state our minds/bodies are in. In a different way, I like to use my body as a pendulum especially when it comes to food. I often stand in the aisle of a grocery store holding different foods or products to see how my body reacts to them. If my body moves left or right, I take that as a “no”…if it moves backward or forward, I take that as a “yes”. Louise Hay wrote a wonderful book called Heal Your Body where she provides possible causes for a variety of health challenges and their corresponding new thought pattern or affirmation. Another book, Feelings Buried Alive Never Die by Karol K. Truman, explores the language of feelings, where they begin, how they manifest in the body, and how to easily transform these feelings. A third book worth exploring, Molecules Of Emotion: The Science Behind Mind-Body Medicine , takes a scientific approach in helping us to better understand the correlation between emotions and our bodies. So this month, let’s take care of our bodies, be present in them, and pay attention to what they have to tell us. 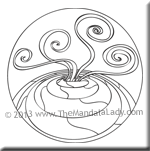 Ponder this as you color the August 2013 Mandala of the Month. Be sure to download Section 8 of the 2013 Mandala of the Year. So true. Being out of body is responsible for so many accidents also.